Another incredibly short post this week with not a lot to see I’m afraid but that is because I didn’t paint a lot in 2008 and I am missing three of the five paintings I did create. Of those five; the one I will be unable to get a copy of was a commissioned portrait. Which I will say probably isn’t a bad thing as I was most displeased with it. The other four paintings I made in 2008 were a set of 11 x 14” box canvas paintings. I remember the idea with them was to create something as quickly as possible. That isn’t to say I was trying to rush but more trying to see what I could produce from my mind’s eye in a short space of time. I was at this point also busy scribbling away ideas for my novel so character creation and concepts were using most of my art time in between and even during my crappy factory job hours. Yes I wrote and drew at work and whenever there was a spare moment. Needless to say that my employers weren’t very happy about my persistent distracted scribbling although they did often compliment my sketches. Back to the topic at hand, painting: here is a photo of the one I was ‘happy’ with out of the four canvas’, happy enough to take a photograph at least. I never really thought it was a great painting but I guess that wasn’t my intention from the outset. Perhaps when I receive it back from England I may improve upon it. I made a similarly coloured landscape involving a lake but felt it lacked depth and vital elements so put it to one side to work into later. For the other two in the set I decided to work in warm colours. I made two desert landscapes, one at sunset and at the other at night. 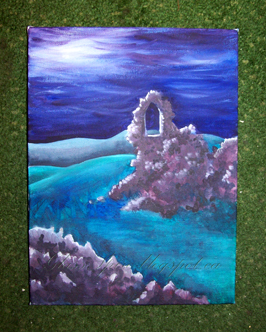 I guess I wanted to express the idea of sand and fading light. Much like the lake painting however I felt they both lacked vital elements and so left them to be worked into at a later date. I am pleased to report that the latter of the two, the night sand, eventually did get worked into! 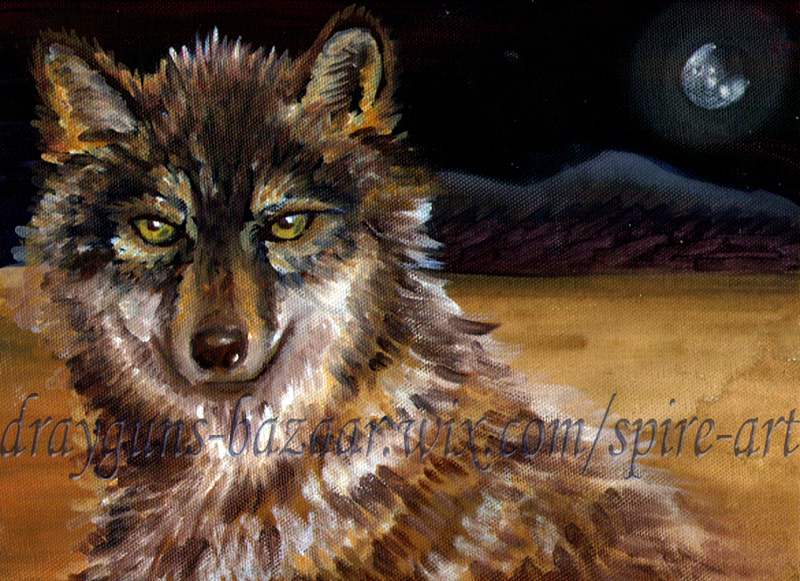 I hope when I receive the other landscapes back from England I can find a way to improve them or put them to good use as I did with night wolf, I may scan and upload the missing two images in this post once they arrive. Still even one success thus far out of four ‘quick’ paintings isn’t bad at all in my books! 24.08.13 - The missing artwork – has returned!